I’ve got big news! 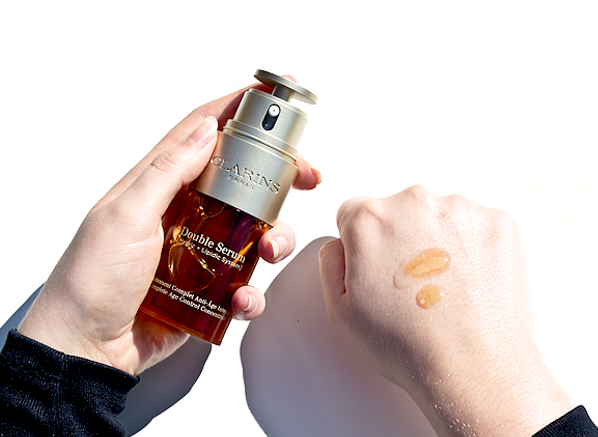 Your favourite Clarins Double Serum has been reformulated. I bet that you’re wondering if it’s going to be as good as it used to be? Don’t panic, as the old saying goes things can only get better. Since its launch back in 1985, the famous Double Serum can do no wrong. Holding the top spot as the ‘No.1 Anti-Ageing Serum in the UK market’ since 2013, the experts at Clarins have been working extra hard on the eighth generation to bring you the best, most efficacious formula to date. After listening to their customers’ feedback, Clarins have made a few simple, yet permanent changes to this best-selling anti-ageing serum. 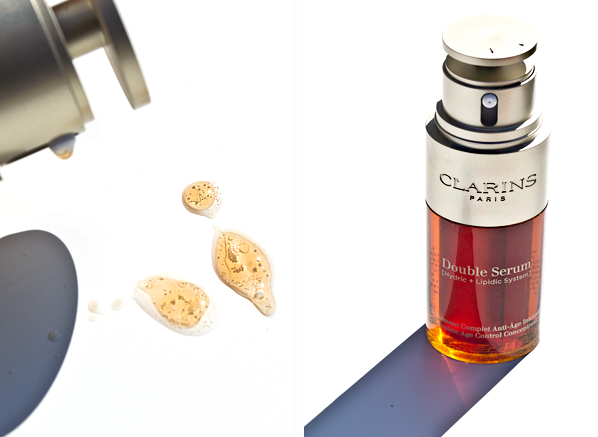 Re-launched on 27th August 2017, here are the innovations that you need to be aware of when purchasing the new Clarins Double Serum formula. New to Clarins Double Serum? This innovative serum targets the 5 vital skin functions (regeneration, oxygenation, nutrition, hydration, and protection) to keep your complexion youthful and healthy, no matter your skin type. 1) Teasel Extract to minimize the look of fine lines, this is also found in the Clarins Multi-Active range. 2) Organic Leaf of Life Extract to boost your skin’s natural hydration levels, this is also found in the Clarins Hydra-Essentiel range. 3) *NEW* Turmeric to improve cell communication for increased radiance and skin vitality. Why turmeric? This household spice has many a benefit. Well known as a heavy duty antioxidant that helps protect your skin from oxidative stress (signs of fatigue, breakouts, ageing), Turmeric improves cell communication in your skin for added radiance. 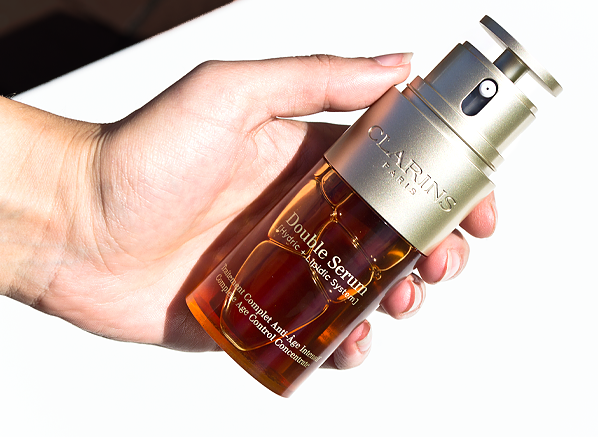 More hydrating, firming and brightening than ever, you can expect to see visible results within one month of using the new Clarins Double Serum. Customised dosing now exists! Fitted with a new, adjustable dial for controlled dispensing, your skin’s temperament can now reap the benefits of this handy push button. As the Double Serum formula is suitable for all skin types, Clarins has given us options in the form of a customisable dispensing system. Now available with packaging that’s controlled by your preference, the new Double Serum lets you dispense more or less product – after all, different skin types and climates do have different needs. 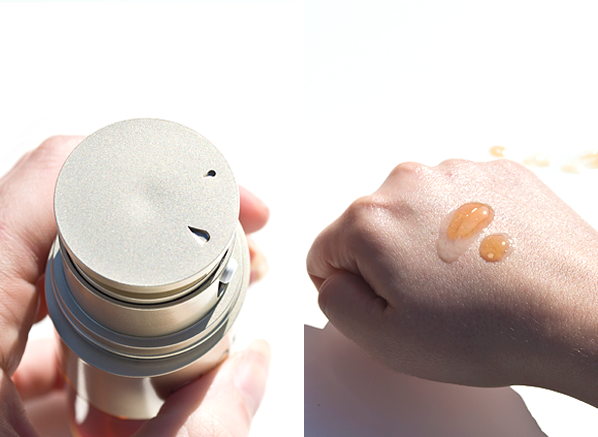 If you have oilier skin or want to use less for daytime, simply switch the dial to the smaller droplet. If you have drier skin or want to use it at night, turn the dial to the larger droplet. This entry was posted on Monday, August 28th, 2017 at 9:07 am and is filed under Brand Focus, Customer Queries, New products, Skincare, Special Post, Spotlight On, Swatches, Tried & Tested. You can follow any responses to this entry through the RSS 2.0 feed. You can skip to the end and leave a response. Pinging is currently not allowed. I’m a big fan of Clarins skincare, but haven’t tried this (new or old formula) yet. It sounds very appealing.